Personality: Ieyasu should be best described as the quiet type. Ieyasu never shows emotion unless the situation demands it. Under normal times and situations Ieyasu will have the same bored expression pastered upon his face. Most of the time Ieyasu wont speak alot. Not much of a talker Ieyasu will stay to his own thoughts and dreams. On the rare occasion Ieyasu engages into a long conversation, this is more than smalltalk, Ieyasu will only do so because of something that intrests him greatly. Ieyasu dosent like to be rushed. Most of the time Ieyasu will take his time in doing things, so engrossed in his thoughts Ieyasu wont do things at a faster rate than he needs to. During battle Ieyasu regards his enemies with the same expression and attitude he gives his comrades: complete boredom and contempt. Battle is the only time Ieyasu will do things at a higher speed rate. Ieyasu enjoys a good battle, but a long carried on one bores him very easily and as such he will want to end it soon. A bad trait in which he recived from his father is the long fuse of temper. It takes alot of things and happenings to make Ieyasu angry. Annoyed, irritated, Ieyasu will become but rarly will he become fully pissed off. On the occasion he is angry people should steer clear as his anger is built up from many previous times. Because of his building of anger, Ieyasu will take most insults and put downs from anyone. He will simply shurg them off in the beginning, but once the anger is built up to much he will blow. And that's when people's ear drums are split. Tanrai regards people of lower rank with contempt and even people with higher rank. He dosent care of rank but more strength to back up the mere title. When it comes to killing Ieyasu has no trouble in doing so. In his eyes killing is something that just happens and it is surly inevitable. In the case of love Ieyasu has absoulte no care for it. Love is merely a feeling of over happniess that is no more than a lie. Special Traits: Ieyasu's left arm is made completely from puppet material. Because of this, it can store and produce chakra much like a normal arm and hand can do. The entire arm is made of tiny segments. These segments intertwine so close together it's impossible to tell wheather it is a real arm or not. But because of the segments the arm is allowed free and more complex movement, flexability, than normals arms. The most distingquished trait about this arm however is the fact that since it is a piece of puppet material, it will not fatigue. Thus allowing longer holding and ect. The strength of the grip is considerably stronger than an average individual, though not necessarily super-human. Special Characteristics: Built within the arm are a few key weapons. Built into the elbow is a long metal (poisoned) spike that is about seven inches in length. Also, built into the hand are three metal spikes that produce from the knuckles. Another weapon stored in it is a small hole in the palm. When opened, a small ball of compressed posion is shot out. When the ball is opened it explodes out with a posioness gas cloud. Ieyasu has a special arsenal of poison of his own. The first coats every weapon on every one of his puppets, when this poison enters the bloodstream through a cut (or through ingestion via breathing or eating) and begins spreading. The poison will spread throughout the body after thirty minutes. Once the poison has spread, it will kill a person in the next 6 days. Removing the poison is a chore due to it sticking to the person's insides. When the poison mixes with blood, it spreads the poison and instead of weakening it, the poison is so potent it only becomes slightly weaker. The time during these six days, is rough as it slowly destroys your internal organs. Shuriken Kage Bunshin no Jutsu is a Ninjutsu technique that uses Kage Bunshin to create multiple physical clone copies from one thrown shuriken. Shunshin no Jutsu is a basic Ninjutsu technique. The ninja will appear and disappear in an instant, allowing them to retreat or attack suddenly. To facilitate the movement the ninja will often use nearby elements such as mist, sand or leaves to mask their appearance or disappearance. Bunshin Bakuha is a Ninjutsu technique. At first glance the clone appears to be a normal Kage Bunshin, but Ieyasu can detonate the clone at any time to form a very large explosion. This jutsu distributes the ninja's chakra evenly among the clones and creates a real copy with form and substance. The clone itself can also utilize any jutsu the original ninja knows. When the clone finally disperses, any new knowledge it has gained is passed back to the original ninja and any additional clones. This makes Kage Bunshin an excellent training method if the ninja has the chakra capacity and stamina to maintain the Kage Bunshins for an extended period of time. This allows the ninja to essentially reduce the time it takes to train and learn with each clone added. Kage Shuriken no Jutsu is a Ninjutsu technique utilizing a giant Fuuma Shuriken. When throwing the shuriken, the ninja will also throw a second giant shuriken to hide in the shadow of the first. The hidden secondary shuriken can then approach the target without their being aware. Kanashibari no Jutsu is an advanced Ninjutsu technique used to temporarily bind an individual or animal. With the person frozen in place, the ninja can either take the opportunity to attack or to retreat. Kawarimi no Jutsu is a basic Ninjutsu technique. When in danger the ninja will quickly substitute themself with another nearby object. This can be a block of wood or even another person. This allows the ninja to quickly flee and hide while the original object takes the brunt of their opponents attack. Description: This jutsu is used by the puppet user Ieyasu. Pushing large amounts of chakra to his hands he then brandishes them and instantly from his finger tips, hundreds upon hundreds of chakra strings shoot out. Because there are so many, it requires alot of chakra to maitain this large amount. As such, this jutsu will only last five posts before Ieyasu's normal chakra strings comeback. Description: Ieyasu sends out earth chakra through either his puppet strings or directly from his hand to the target. This causes the puppet's skin to become extremely hard, anything such as swords and other objects of the like will find it impossible to break through. Description: After forming the needed Snake handseal, Tenrai will harden his body using the Earth Element. This provides greater defense against attack and will also strengthen his arm to increase his striking ability. Like other Doton based jutsu, it is weak against Raiton attacks. Byaku is an extremely tall puppet. While he is of regular width (for a normal puppet) his height is extreme. Standing at an impressive eight feet tall Byaku is made of light brown wood. He has long dark hair that falls over his smooth, and almost human like, face. Byaku has four limbs, two legs and two arms and a long tosro. But these traits are hidden over his large cloak. For covering his body from neck down is a thick black cloak. This gives him the apperance as being a large head ontop of a mess of black cloth. Byaku's body was made especially for his unique ability. His entire chest and stomach is a hollowed out cavity. In here lies hundreds of metal shards (explained in weapons) These can open outward to let free the shards. Also, on every arm and leg and on his neck are dozens of small slots that can be opened at any moment. Thus freeing the shards of metal. Weapons/Abilities: Byaku has one extreme ability that is used for long (and sometimes close) ranged attacks. His entire body is filled to the brim with hundreds of small shards of metal. All the metal in his body is stored within a large cavity in his stomach and chest. At any time (at the command of Ieyasu) Byaku will slide back a large plan on his back and stomach and chest. At the same time dozens of small rectangle shaped slots will open up on his arms, legs, and neck. Then Ieyasu will usher another command. Byaku will start to shake madly and in a matter of seconds all the pieces of metal will fall from Byaku's body cavities. At this time Ieyasu will use his *Million String Jutsu, and connect tiny lines to each and every petal. And with the shards of metal connected he will move the large quantities of metal in anyway he desires. Kutsuu stands at a impressive height of five foot six. He has a long slender body thats segemented. Kutsuu is covered in a long robe that falls past his long legs. 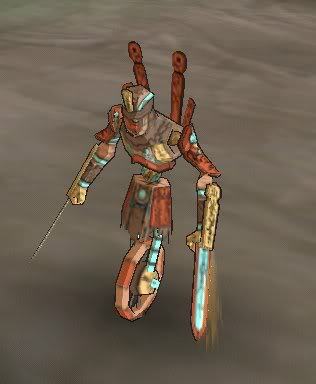 Strapped on his wodden back is a long weapon of segmented metal capped with a thin blade. Kutsuu's specality relays in the mere fact that almost everything about him is bound to a posion center. On top of his cloak covered torso is a think head of dark wood. On top of the head is a stiff tuff of bright red hair. The cloak that he wears goes past his legs making it look like he has non at all. Because of the way he was made, Kutsuu's head is bound to a thick metal chain that coils in his shoulders. At any moment his head can move from his torso with a good amount of speed. Weapons/Abilities: Kutsuu's long sengented blade, the metal part, is posioned. At any moment Kutsuu can lower a small plank in his mouth and expell a think posion gas. On this; his metal pointed teeth are also posioned. Because Kutsuu is bound by many chains he can extend his head from his body and brandish his teeth in an attack. His final posioness ability lies under his spiky red hair. Hidden under the hair is a small hole in which a large dagger will come out of at a moments notice. All of the posion that Kutsuu has on him, and uses is of homemade creation. The posion gas is the only different posion however, for once breathed in it slows the rate at which blood in pumped through the body. This slows down movement and fatigues the opponent. The final weapon of Kutsuu is that in each of his palms are rouch sealed holes. These can open and senbon can shoot from the holes. (About ten from each arm) these are posioned as well. Ranzatsu is extremely tall. About seven feet at his highest. He has a thin segmented body. Corse red hair sprouts from his diamond, serpent shaped head. Sticking from his body are four long arms each armed with a different weapon. Ranzatsu dosent have legs like other puppets but he does have a long segmented tail. Weapons/Ability: Ranzatsu has 4 arms with a different weapon attached to each; the top right arm has a crescent moon blade, the bottom right has a fork shapped blade, the top left has a large claw, and the bottom left has a midnight black sword. The arms are able to detach from Ranzatsu but they are tied to the body by chains. Each arm has about 10 meters of chain attached to it and the chain is kept within the body. The tail is the simplest part of Ranzatsu's body. It doesnt have any secrets besides having the abilty to disconect the segments of the tail, there is a small chain running down the middle, so its reach is longer. Note the tail is heavily posioned with Ieyasu's own special poison. Houshoku is large, there is no other way to say it. He is kind of tall, about six foot but his real vastness lays with his width. Houshoku has an extremely large stomach. It bulges outward many many inches. To match this his shoulders are extremely large. His stomach is matched only by his huge burly arms and legs. On the top of his massive stomache a small squat head rests. It has small ears and large eyes. But no one would ever see this for Houshoku is always covered in a large black cloak. It reached his feet and covered every inch of his body. At always, a large hood covers his face. The reason for this is because of his hollow and large stomach; in which Ieyasu resides and commads the puppet. From in here, Ieyasu can see and control him. This is Ieyasu's main way of traveling for cover. Weapons/Ability: Yourdan has a select few weapons, being that he is mainly for transportation. But none the less he has some weapons and skills. Within his beak lay twenty kunai. All which are shot at a command by a powerfull kunai launcher. Each Kunai is tipped with Ieyasu's own posion making them extremely deadly. The second weapon he has orignates on all of his four wings. Three eye sized holes line each of the winds of Yourdan. In each of these holes are a thick purple liquid. And at a command, a plank will slide back and the liquid will hit the air (please not the liquid remains in liquid state because the chamber that holds it is air tight) Once the posion hits the air, it will become into a gaseous substance. If all four are released at one time it will cause a huge cloud of posion gas around the puppet. At least ten meters in disameter. Kaname, being one of the first puppets made by Ieyasu, is extremely boring in looks. In fact, he had no looks at all. A simple average sized, six foot, and average width manakin of a human man. Normal length of arms and legs and chest and torso. Kaname is a dark brown in color and has segmented joints where he connects in the arms, legs, and necks. The only odd thing about him however is that he has three heads. Each head is completely blank save a small hidden panel on each. The heads are connected to the torso by think metal chain. The most noticable trait of Kaname is the fact that every square inch of his body is covered in tiny round poles. Each pole is about the width of large coin, and sticks out of his body a fraction of an inch. Weapons/Ability: The weapons of Kaname are extremely simple. Simple, but deadly. Every one of the rounded poles sticking shortly from his body are actually very long. They go into his body. These poles are filled with seven senbon in each pole and at a single command, all of the poles (or a selected few) will shot from the body and one they do a command can be given for the poles to split and the senbon will shoot out. Each and every pole on his body (there are many of these) have this ability. The second weapon trait Kaname has lays within the three heads. In each head are a plank than can slide backwards and release whatever is stored within. In the middle head, is a large quantity of smoke bombs. These can be set off at any time. In the left and right, however, are a collection of seven of kunai. The kunai can be shoot from the head with the force of an arrow. Reaper is a short hunched puppet made by Ieyasu. A long tattered black cloak coveres the body of Reaper save for two parts. The first is the head, which is a pale white faced head. The head is diamond shaped and curves down. A wild grin of pale sharp teeth are barely visable under the sloping head. Two large and menacing eyes are dead center of the face. The second part of Reaper are his arms and shythe. Two long arms extend out from the cloak. Clutched madly in the hands of the arms is a long seven foot heavy shythe. Now while Reaper looks like a normal sythe weilding puppet this is all false. If one would look under the cloak of Reaper they would see there is no humanoid body. Instead, a long curled up body of a snake. The width of the head, and the length of ten feet the long body of Reaper is extremely segmented. On each segment, long spike extend outward. As for the arms and the shythe, this is merely a part of it's own. Simply two arms attached to a shythe. Weapons/Ability: The two weapons REaper has go as follow. The first are the long arms that are connetced to the Shythe (note: the sthye is in no way connected to reaper, while it may look like it with the cloak on it really isnt) The shythe is very sharp and the tip is coated in Ieyasu's special posion. The second part of weapons are Reapers long snake like body. Once he had uncurled to his ten foot length, the segments on his body will start to spin around madly. And because of the spikes on each segment, the spinning makes them a deadly weapon. Ieyasu moves Reaper like a fast moving drill. Weapons/Ability: The most distinctive feature of this puppet is how it has two blades in place of hands. These blades are always kept razor sharp and in a very good condition. In it's forearms are two small flamethrowers that can blast small streams of fire down the two blades as it cuts, or super heat the blades to turn them red-hot before attacking, to sear flesh as it cuts. The blades are retractable, and can be retracted so that the flamethrowers can be used without the blades getting in the way. Besides the blades and flamethrowers, another two distinctive devices are the ball-joint at the waist and the large wheel that it has in place of legs. The ball joint can make the upper torso and arms rotate at very fast speeds. Doing this while holding the two blades out can slash through just about anything in it's path. The wheel can be used for the puppet to roll on very fast. It appears that it is hard to balance, but while the puppeteer is controling the puppet with chakra strings, it's relatively easy to balance it while it's torso is spinning, or while it's moving at high speeds. Weapons/Ability: Covering all of Thorn's body are long, sharp and extremely deadly spikes. Each of these spikes are tiped with Ieyasu's own posion. At a command the spikes can shoot outward with a deadly force. Covering the shins, arms, and torso and head of Thorn is a thick metal armor. 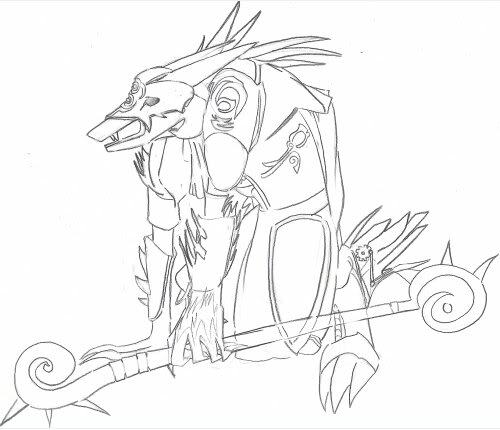 (Holes allow the spikes underneath to get free) Aside from Thron's large posioned teeth that can latch down with a vice grip, Thorn has a long two ended staff that curved at the end and is tiped with spikes. (Also posioned) In Thorn's mouth are about seven kunai that can shoot out with a great force. Weapons/Abilities: Gin is one of Ieyasu's most accomplished puppets. Being a master puppeter Ieyasu contructed Gin so well that she gives the impression of being human. Gin is short, about five feet. Gin sports long silver hair, glowing green eyes and a long snow colored attire. She is the most peacefull looking puppet in Ieyasu's arnsenal. Gin has been loaded with many weapons. The first weapons are her palms. Two holes in each of her palms can open and a long sword will slide out of each. Another trait about Gin which makes her great is the fact that Ieyasu has placed insider her head many flash bombs. At a command Gin's eyes will open wide and the flash's will go off. The force of the light is extremely strong. Gin's hair may look normal, but in reality every strand of hair on Gin's head is a posion dipped needle. At a command the needles can shoot off. Gin's mouth can open and when it does, a barrage of seventy or so senbon can shoot out. White Bombers are Ieyasu's most quantative puppets. Stored in a scroll Ieyasu has a total of thirteen of these puppets. Knee high, and width of a human these puppets are tiny. They have no face, rather a smooth panel of wood serves as their face. They have a large cap on their head that is bright red. And they sport long white robes. Stored in the robes are hundreds of senbon all lined up. In their 'cap' are dozens of paper bombs. When ignited, the head blows up and thus shooting out senbon. These are very usefull puppets.